PET stands for Positron Emission Tomography and is new technology available for detection and diagnosis of cancer including lung, breast, melanoma, lymphoma, colorectal, head and neck, ovarian, pancreatic, esophageal and other cancers. Cancer can spread silently in the body. When symptoms appear, it may signal more advanced disease. PET exposes "silent" disease. PET allows a physician to examine large areas of the body in a single scanning session, producing images of human body functions unobtainable by other imaging techniques. These images capture biochemical processes, such as tissue glucose metabolism, that often cannot be revealed by anatomical imaging with conventional X-ray, CT, or MRI. Illinois Cancer Specialists is an ACR Accredited Facility for both PET and CT. This means our facility has met the standards for the highest level of quality and radiation safety. 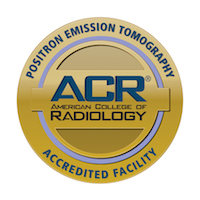 Our staff has been thoroughly reviewed and accredited by the American College of Radiology, a national professional organization serving radiologists, radiation oncologists, nuclear medicine physicians and medical physicists. Therapies that may not be helpful. Greater peace of mind for patients and their families, knowing that this technology provides comprehensive information. This technology also eliminates a "wait and see" approach, commonly used to monitor the patient during post-treatment. It may be used during the actual treatment phase at times to evaluate the patient's response to therapy. To evaluate the significance of changes seen on CT exams or other imaging modalities. Is a lesion benign or malignant? Where is the cancer? Is it spreading? Is there a recurrence of cancer?